The most effective screening and selection processes use the quickest and least expensive components early in the process and hold off using lengthy, expensive, labour intensive components to be used only after initial screening. Effective screening includes making certain that the applicant has the basic necessary experience and background as well as determining if they posses the core traits and attitudes you have found to be predictive of success in that job. It is important that each company determine which process is best suited to its needs, but the example below can be a good initial guide to consider. NOTE: Individual jobs within a company may have different processes depending on which competencies are necessary for success in that particular position. The more responsibility and unique the job is, the more likely you will have additional tasks to perform in the screening process. 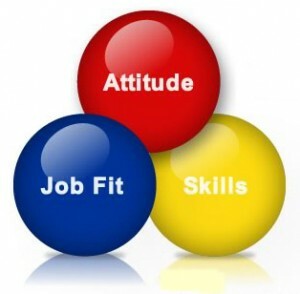 The Attitude Fit tool shows the candidate’s attitudes toward work and work-related issues by measuring for counter-productive behaviours. The Onboarding tool helps the manager better understand the personality characteristics and learning styles of the new employee in order to maximize performance as quickly as possible. Our Pre-Hire assessments will alert you to counter-productive behaviours, and determine engagement, Job Fit and tell you how to train new employees. You’ll find higher quality candidates before spending time interviewing them. All our assessments are designed and validated for “business use”; they are web-based using just a browser; there are no plug-ins required and with no expert interpretation needed.